Kader is a lovely rare small doll with B3512 1/4 "made in Hong Kong" on the back of his body. He is also wearing his original romper outfit which is also tagged "made in Hong Kong". This outfit is showing a little age related marks to it as it is over 50 years old. Never the less it is wonderful to be still in the original outfit. .jointed at the neck, arms, wrists and legs and these can be moved to different poses.
. moulded curls at the front of her head and around the sides at the back.
. complete black hard plastic eyelashes.
. tongue moves with the movement of the eyes.
. body has a lovely overall pink flesh colour although one leg has lost some of its colour - see photo.
. the centre head seam has the usual left over glue residue which has darkened over period of time. .some old glue residue on front molded curl - he may have had a little hair on his head perhaps in his past life. 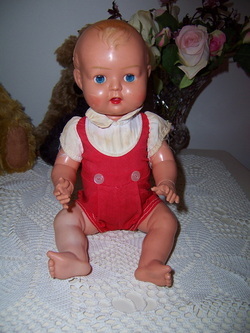 A lovely small Kader doll in original outfit. ﻿A pretty little Kader doll 16 1/2" tall. She has piercing blue eyes with grey eyeshadow around each eye. 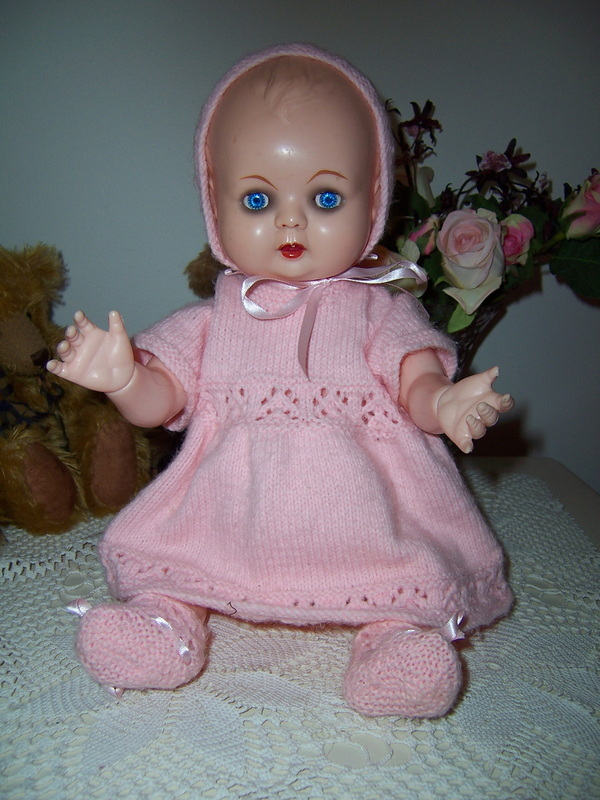 She is dressed in a vintage pink hand knitted dress, bonnet, booties and white knitted pants. Kader is a very light doll, although her head is made of hard brittle plastic and the rest of her body is made of a softer pliable plastic. .original mama box not working but could be replaced if desired - just a matter of taking out old box and putting in new mama box in its place. Kader is 16 1/2" tall and is a very light doll, although her head is made of hard brittle plastic and the rest of her body is made of a softer pliable plastic. 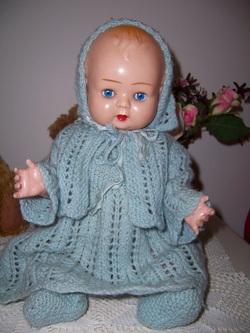 ​She is wearing a vintage hand knitted blue layette outfit. ​The outfit is in great condition with no rips or repairs, and would have been made for her when she was new. She is really in great condition and a truly vintage outfit.